Namibia has enjoyed a good reputation for its nature conservation, but there is evidence the illegal trade in wildlife products is taking off. Chinese journalist and recent Oxpeckers fellow Hongxiang Huang travelled to the smuggling hotspot of the Zambezi border region where five Southern African countries intersect to investigate the Chinese connection. In the remote Zambezi region of Southern Africa, where Namibia shares international borders with Angola, Zambia, Botswana and Zimbabwe, geography and opportunity create ideal circumstances for ivory poachers. With more than 9 100 residential elephants and 30 000 migrating elephants, according to 2013 data, elephant poaching was not a serious issue in the transborder area until recently. In 2010 and 2011, the numbers of elephant poached in isolated cases were four and six respectively. However, in 2012 the situation changed, with at least 78 elephants poached by international smugglers in one year. By November 2013, official records showed that at least 20 elephants had been poached since the start of the year, and 35 smuggling suspects had been arrested. Namibia was the first African country to incorporate protection of the environment into its Constitution and today more than 40% of the country’s surface area is under conservation management. Community-based conservancies are well integrated into the tourism industry. 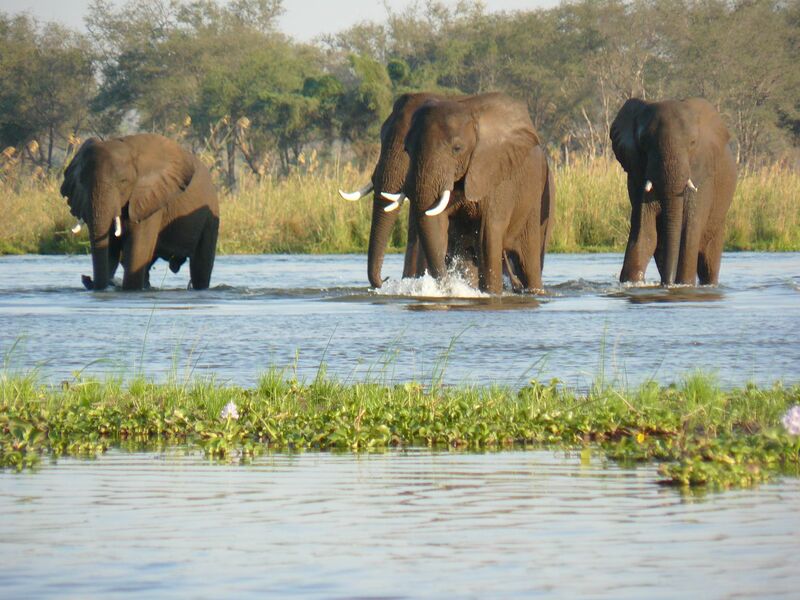 In the Zambezi region, formerly known as Caprivi, officials noticed a growth in wildlife trafficking from around 2010. “That Chinese [man] you mentioned appears to be the most important middle player in it, although some other nationals have their channels as well,” said Shadrick Siloka, chief warden in the Ministry of Environment and Tourism (MET) office of Katima, the capital of Zambezi region. During my first visit to the MET office two days previously, officials had been reluctant to release any information, but once I shared some results from my own undercover investigation in the Chinese community of Katima, they were prepared to admit they were investigating the same person. According to Siloka, the change in the status quo was associated with hearing the name of Guo Yunhui, a Chinese businessman in Katima. In 2010, the MET heard from informers that Guo was collecting pythons and pangolins. In 2011 Guo was arrested for buying two ivory tusks from MET staff, fined 20,000 Namibian dollars, and released. But informers and the MET allege that he is again at the centre of the Namibian ivory trade, and is using the same transportation and trading routes as his formal business. My undercover investigation supported this theory. In his everyday persona, Guo Yunhui is the owner of Sweet Guest House, the only Chinese hostel in Katima, although its clientele are mostly Africans, many from Zambia. Like many other Chinese, he has his main business and then informal business, and consequently he rarely shows up at his guesthouse, which is managed on a daily basis by two local women. As a Chinese journalist I was able to meet and socialise with many Chinese shop owners in Katima, and to ask about Guo Yunhui and the trade in animal products. Zheng, a Chinese worker in a Chinese construction company near Katima, is a friend of Guo’s family and he visits them frequently. According to Zheng, Guo is still engaged in his wildlife smuggling business. Chen, a Chinese businessman in Rundu, also confirmed that Guo is active in the business, although he didn’t characterise it as smuggling, but rather as helping Chinese in far-flung cities to acquire ivory souvenirs. Ou, a Chinese shop owner, claimed he lent Guo money when Guo was buying ivory in the past, and that Guo was conducting a lot of informal “side business” of a dubious nature. However, Ou had not seen Guo for a long time. Guo may not be the largest player in the Zambezi ivory market, according to Li, a leader in the Chinese Fujian business communities of Namibia. Li referred to another Chinese man in Katima whom he said was found by police in early 2013 with more than 100kg of ivory, but MET said it did not know about the case. The low risk of getting caught, added to monetary incentives and the Chinese community’s lack of support for the Namibian conservation effort, are all factors encouraging and enabling wildlife smuggling. Katima is a central hub of trading between trans-border African smugglers and Chinese shop keepers and traders. Chinese shops dominate the main road in town, and unlike Chinese state-owned companies’ employees, who are driven by state policy, these Chinese shop owners are usually self-driven immigrants simply looking for business space and an opportunity to make money. Most of the time they are from second- or third-tier cities or small towns in China where services are poor, and consequently they are characterised by low educational achievements and poor foreign language skills. Outside China, even the Chinese government does not have clear statistics about them, not to mention effective management. My investigation indicated the majority of them are from Fujian province, including the ivory smuggler Guo Yunhui. Many of the shop owners are linked to the ivory trade in the guise of buying and selling of ivory souvenirs and artifacts for export and sale to tourists. Because of the widely perceived permissibility of the small “souvenir” trade in ivory products, the Chinese community members are reluctant to blow the whistle on the larger ivory smugglers, and alleged involvement by Chinese diplomats themselves, even though they are aware that these individuals are ruining the reputation of Chinese businesspeople more generally in Africa. Many Chinese shun the easy money to be made by ivory and rhino horn smuggling because they know it is wrong and illegal. But relations with host country law enforcement and conservation officers remain too weak for them to break their false loyalty to other Chinese nationals, even when they are indulging in criminal behaviour. In Katima, it is common for Chinese people to be approached by African ivory sellers, mostly Zambians. Ou said in the 10 years he has lived in Zambezi he has been approached many times by sellers who tell him how high the profit is if he would transport ivory from Namibia to China. This is confirmed by the MET, who recorded that the price Guo paid to the sellers of ivory was 300 Namibian dollars per kilo, whereas in Asia the selling price is at least 3 000 US dollars per kilo. In Oshikango, another border town west of Katima, I spoke to Yang, a shop owner in Chinatown. “Zambians used to come to our Chinatown with boxes full of ivory, and lots of Chinese shop owners have bought them,” he said. He claimed to have taken small amounts of ivory back to China many times, and they were never found by customs. Yang also said he had bought some rhino horn powder, but did not want to detail. “I know there are people smuggling full rhino horns back to China, but you are being too curious. Don’t ask too much about such things,” he said. “In 2012 the amount of ivory we captured was 70% to 80% of the amount of ivory taken from poached elephants in Namibia,” said Morgan Saisai, the chief control officer of MET in Katima. 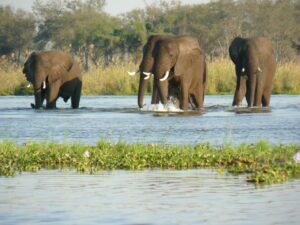 According to MET officials, the ivory on the Zambezi market is not only from local sources, but is being transported from surrounding countries. The criminal groups they have apprehended included Zambians, Congolese and Zimbabweans working with Namibians. “Zambia is where ivory and smugglers are most likely to come into Namibia,” said Oswald Rall, a former policeman still living in the region. Katima is where it is easiest for the Chinese people to buy ivory from Zambians. Infrastructure is rapidly improving, not least because of Chinese road construction projects. Truck routes from Walvis Bay on the coast to Rundu and Katima, then on to Zambia and the Democratic Republic of Congo, are relatively efficient and fast. Using trucks and networks for transporting other goods business, ivory is transported to areas with the highest densities of Chinese. It is placed in the retail markets, and becomes small souvenirs for Chinese people to carry home to China in their luggage. What is most worrying for the conservation of elephants is that the ivory trade is just one of a number of illegal behaviours which are viewed as normal and far from wrong among the Chinese residents. Eager to make personal gains, many do not care whether it is legal or not as long as punishment is avoidable. In such a context, buying small amounts of “souvenir” ivory is not considered smuggling, so that a large ivory market is formed by many individuals buying small retail amounts which collectively represent a large amount wholesale. According to the Chinese who take home souvenirs, the chance of ivory being discovered by airport customs in Namibia or China is very low and even when it is found, the consequences are not severe. During this investigation, many Chinese expressed the view that they wished the Chinese immigrant communities could be better managed in order to reduce the reputational damage being done to all Chinese people in Africa by the activities of just a few. This view is made more apposite as long as the small traders remain beyond the reach of the law, and are thus tempted to join the illegal trade. While ivory trade in Namibia is not yet as large as in other African countries like Mozambique, it is growing. There is evidence that the scale of trade is more than a few Chinese families buying from Africans across the border and reselling small souvenirs to other Chinese people. In fact, this characterisation indicates a dangerous complacency, particularly as the evidence shows that much bigger volumes are trading through these networks – and they include wildlife products from other endangered species besides elephants. • Some names have not been divulged because of the sensitive nature of this investigation.